Back Bay Books, 9780316473040, 240pp. 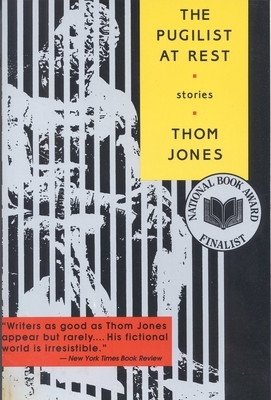 Thom Jones made his literary debut in The New Yorker in 1991. Within six months his stories appeared in Harper's, Esquire, Mirabella, Story, Buzz, and in The New Yorker twice more. "The Pugilist at Rest" - the title story from this stunning collection - took first place in Prize Stories 1993: The O. Henry Awards and was selected for inclusion in Best American Short Stories 1992. He is a writer of astonishing talent. Jones's stories - whether set in the combat zones of Vietnam or the brittle social and intellectual milieu of an elite New England college, whether recounting the poignant last battles of an alcoholic ex-fighter or the hallucinatory visions of an American wandering lost in Bombay in the aftermath of an epileptic fugue - are fueled by an almost brutal vision of the human condition, in a world without mercy or redemption. Physically battered, soul-sick, and morally exhausted, Jones's characters are yet unable to concede defeat: his stories are infused with the improbable grace of the spirit that ought to collapse, but cannot. For in these extraordinary pieces of fiction, it is not goodness that finally redeems us, but the heart's illogical resilience, and the ennobling tenacity with which we cling to each other and to our lives. The publication of The Pugilist at Rest is a major literary event, heralding the arrival of an electrifying new voice in American fiction, and a writer of magnificent depth and range. With these eleven stories, Thom Jones takes his place among the ranks of this country's most important authors.